Astronomers using the Atacama Large Millimeter/submillimeter Array (ALMA) telescope in northern Chile have today announced the discovery of an unexpected clump of carbon monoxide gas in the dusty disc around the star Beta Pictoris. This is a surprise, as such gas is expected to be rapidly destroyed by starlight. Something — probably frequent collisions between small, icy objects such as comets — must be causing the gas to be continuously replenished. The new results are published today in the journal Science. 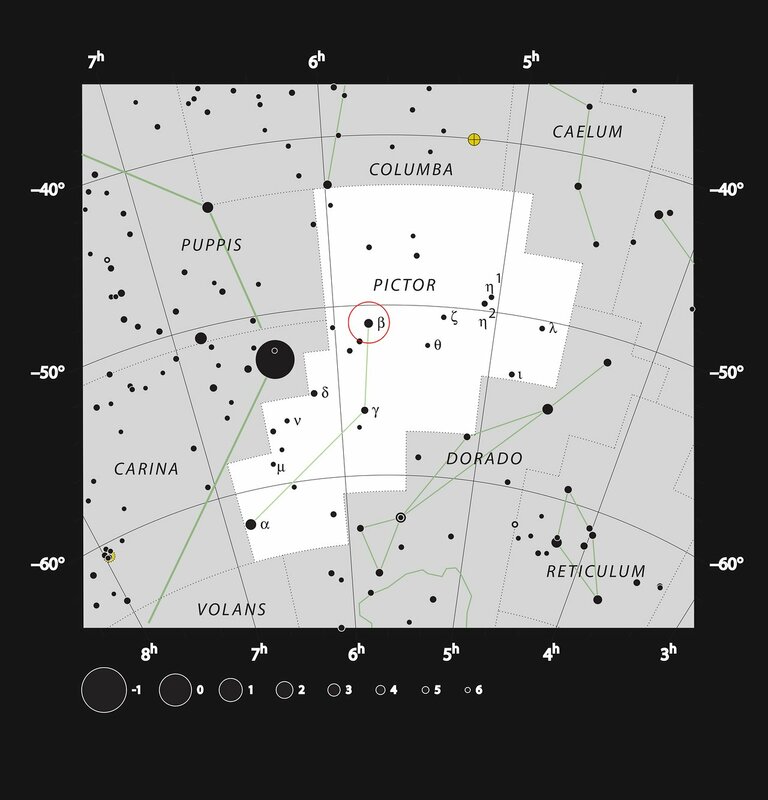 Beta Pictoris, a nearby star easily visible to the naked eye in the southern sky, is already hailed as the archetypal young planetary system. It is known to harbour a planet that orbits some 1.2 billion kilometres from the star, and it was one of the first stars found to be surrounded by a large disc of dusty debris . New observations from ALMA now show that the disc is permeated by carbon monoxide gas. 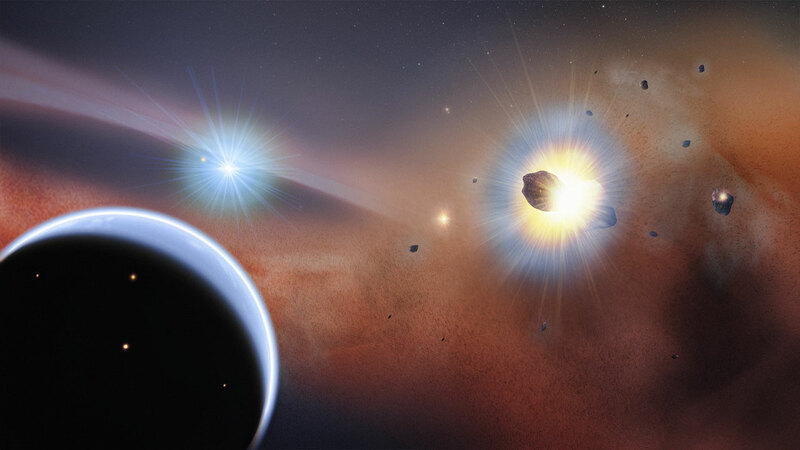 Paradoxically the presence of carbon monoxide, which is so harmful to humans on Earth, could indicate that the Beta Pictoris planetary system may eventually become a good habitat for life. The cometary bombardment that its planets are currently undergoing is likely providing them with life-enabling water . But carbon monoxide is easily and rapidly broken up by starlight — it can only last about 100 years where it is observed in the Beta Pictoris disc. 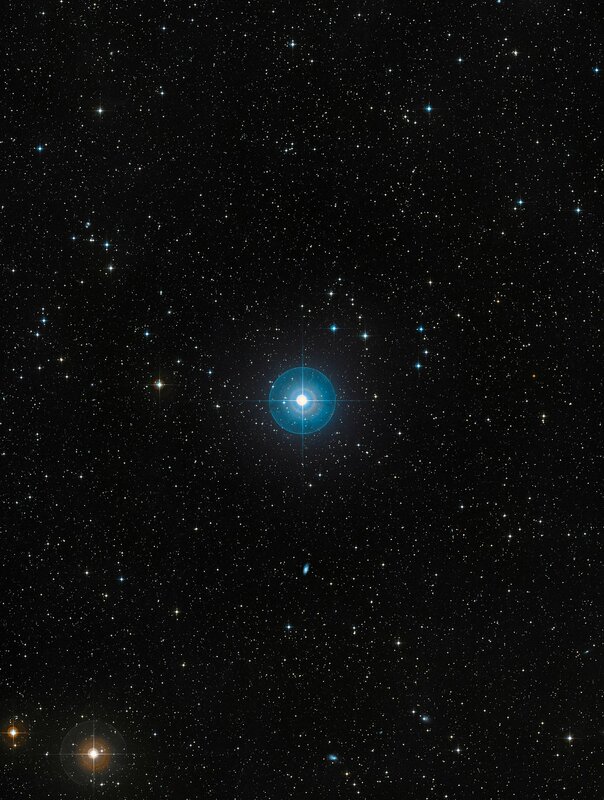 Seeing it in the 20-million year old Beta Pictoris disc is a complete surprise. So where did it come from, and why is it still there? 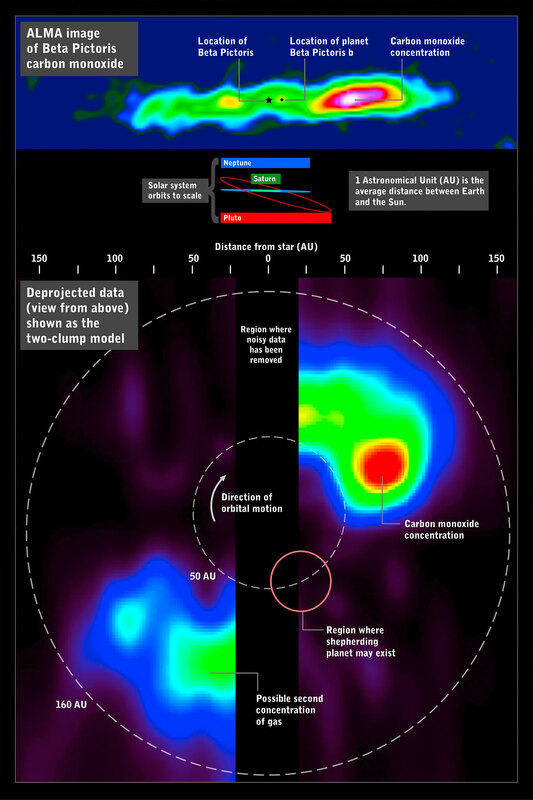 But there was another surprise in the ALMA observations, which did not just discover the carbon monoxide, but also mapped its location in the disc, through ALMA’s unique ability to simultaneously measure both position and velocity: the gas is concentrated in a single compact clump. This concentration lies 13 billion kilometres from the star, which is about three times the distance of Neptune from the Sun. Why the gas is in this small clump so far from the star is a mystery. “This clump is an important clue to what is going on in the outer reaches of this young planetary system,” says Mark Wyatt, an astronomer at the University of Cambridge, UK, and a co-author on the paper. He goes on to explain that there are two ways such a clump can form: “Either the gravitational pull of an as yet unseen planet similar in mass to Saturn is concentrating the cometary collisions into a small area, or what we are seeing are the remnants of a single catastrophic collision between two icy Mars-mass planets”. Both of these possibilities give astronomers reason to be optimistic that there are several more planets waiting to be found around Beta Pictoris. “Carbon monoxide is just the beginning — there may be other more complex pre-organic molecules released from these icy bodies,” adds Roberge. Further observations are planned with ALMA, which is still ramping up to its full capabilities, to shed more light on this intriguing planetary system, and so help us to understand what conditions were like during the formation of the Solar System. Many stars are surrounded by swirling clouds of dust, known as debris discs.They are the remains of a collisional cascade of the rocks in orbit around the star, much like the collisional breakup of the space station depicted in the movie Gravity (but on a much larger scale). 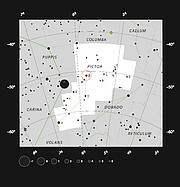 Earlier observations of Beta Pictoris were reported in eso1024 and eso0842. Comets contain ices of carbon monoxide, carbon dioxide, ammonia and methane, but the majority component is a mixture of dust and water ice. This research was presented in a paper entitled “Molecular Gas Clumps from the Destruction of Icy Bodies in the β Pictoris Debris Disk” to appear in the journal Science on 6 March 2014. The team is composed of W.R.F. Dent (Joint ALMA Office, Santiago, Chile [JAO]), M.C. Wyatt (Institute of Astronomy, Cambridge, UK [IoA]), A. Roberge (NASA Goddard Space Flight Center, Greenbank, USA), J.-C. Augereau (Institut de Planétologie et d'Astrophysique de Grenoble, France [IPAG]), S. Casassus (Universidad de Chile, Santiago, Chile), S. Corder (JAO), J.S. Greaves (University of St. Andrews, UK), I. de Gregorio-Monsalvo (JAO), A. Hales (JAO), A.P.Jackson (IoA), A. Meredith Hughes (Wesleyan University, Middletown, USA), A.-M. Lagrange (IPAG), B. Matthews (National Research Council of Canada, Victoria, Canada) and D. Wilner (Smithsonian Astrophysical Observatory, Cambridge, USA).